A man who stood outside a Manchester mosque after the shooting of 50 people at mosques in New Zealand said he wanted to "respond with friendship". 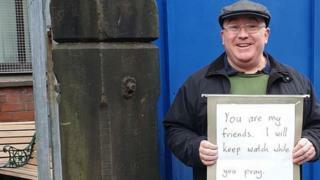 Andrew Graystone was pictured with a placard saying: "You are my friends. I will keep watch while you pray." He said Muslims at a Levenshulme mosque "beamed" when they saw his act. "There are two ways you can respond to an attack like this - you can respond with fear or you can respond with friendship," he said. Images of similar acts at mosques in the Midlands and North East of England have also gone viral. It follows the shootings of people attending two mosques in Christchurch. Brenton Tarrant, a 28-year-old Australian, has been charged following the attacks. Mr Graystone said he chose to stand outside the Medina Mosque on Friday because he "wanted to make sure that people know we can respond with friendship". "As people walked up, you could see in their eyes that they were looking at somebody standing outside their mosque, thinking 'Oh no, is this some kind of protest or whatever'. "And then when they saw the message saying 'You are my friend', their faces broke and they beamed and smiled." Mr Graystone, who runs a Christian charity and led London 2012's multi-faith chaplaincy team, said he was surprised the image of him was widely praised on social media, including by Paralympian Baroness Tanni Grey-Thompson. "I hadn't intended for anybody other than the people at Medina Mosque to know about this," Mr Graystone said. "But I guess there are little things that lots of people can do to just express friendship rather than fear with Muslim friends, and neighbours and colleagues - so I just took one little action."